Goofy Golf opened in 1959 and is located in the heart of the Miracle Strip. 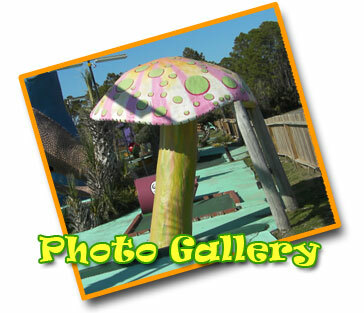 Created by Lee Koplin, Goofy Golf is still in the family and is owned by Koplin’s daughter, Michelle. Goofy Golf boasts 2 18 - hole miniature golf courses and remains the best mini-golf bargain anywhere at $10 per 18 holes! The evening lighting includes the glowing eyes of giant monkeys and dinosaurs! There are giant statues that can be climbed for a view and others you can go inside. It’s mini golf with a bonus play-land! Only $10 per 18 holes! Original Postcards from 1959 available at the front desk.